The iPad Pro 9.7 is my third iPad. I bought the first one on the day it was released. I fell for the beautiful retina screen on the iPad 3 and got hooked by the increased performance, improved screen and the new Apple Pencil on the iPad Pro. The Apple Pencil is expensive, flawed and fantastic. For me, it’s made digital annotation and markup a joy. In meetings, the iPad Pro allows me to scribble away on digital paper, capture whiteboards with the camera and annotate all over them. I can quickly sketch visualisations and workflow diagrams, whilst keeping an eye on email, Skype and other office based distractions that I need to have around me. These days, iPad Pro owners are spoilt for choice when it comes to digital scribblers. But one area where apps have almost universally come up short, is text conversion. They just can’t do it, at least when faced with my ‘IT guy’ scrawl. Well, that’s what I thought before I downloaded Nebo. I think I would have missed Nebo had it not been a ‘Free app of the week’ on the App Store. It actually sat unlaunched for quite a while before I broke away from OneNote and Noteshelf for long enough to try it out. On the surface, it’s a clean, but slightly limited note taker app. A simple folder, notebook and page structure allows you to keep some order. It’s logical, but not as nice to look at as NoteShelf’s attractive library. Speaking of NoteShelf, Nebo also doesn’t offer a beautiful range of digital stationery that I love the former for. No virtual pencils and fountain pens here, just a simple pen and eraser. There is, at least, a nice colour wheel, so any ink colour you want is possible. So far, so boring. What’s the, erm, draw? Well, for starters, the inking technology is fantastic. There’s next to no lag and accuracy is as good as you would want from the Apple Pencil. In meetings, you won’t be fighting this app and wrist rejection etc all functions perfectly. It’s even faster than the aforementioned Noteshelf! Secondly, gestures. If you’ve made a mistake, scribble it out and the app will delete it. Need to drop some text to a new line, or separate a word into two? 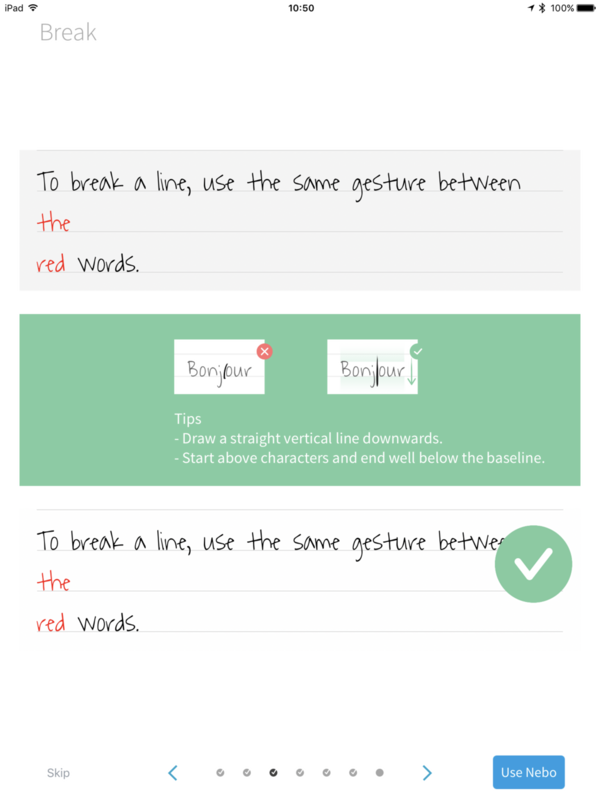 Simply draw a short downward stroke and the app will do the work for you. No more stopping writing for some cut and paste to stay organised! As is common in these apps, you don’t just have to write. You can also sketch, draw diagrams or even equations! Starting one of these opens a resizable box on the page into which you can start to draw pictures, flowcharts or get down to some numbers. It works really well and all these boxes can be moved around if you want to change the page order later. So we have all the ingredients for a good quality, simple note taking app. Final ingredient - fast, accurate text recognition and conversion that actually works! Yes! As you write, you can enable a realtime window that floats above the line showing you what it thinks you’re writing. Obviously it’s not 100% perfect, but I challenge you not to be very impressed. Also, if you see it’s got a word wrong, tap on it with the pencil and it will make other suggestions. It’s rare not to see the correct word in the list, so another quick tap and you’re back on your way! Other common notetaking formats are also recognised. 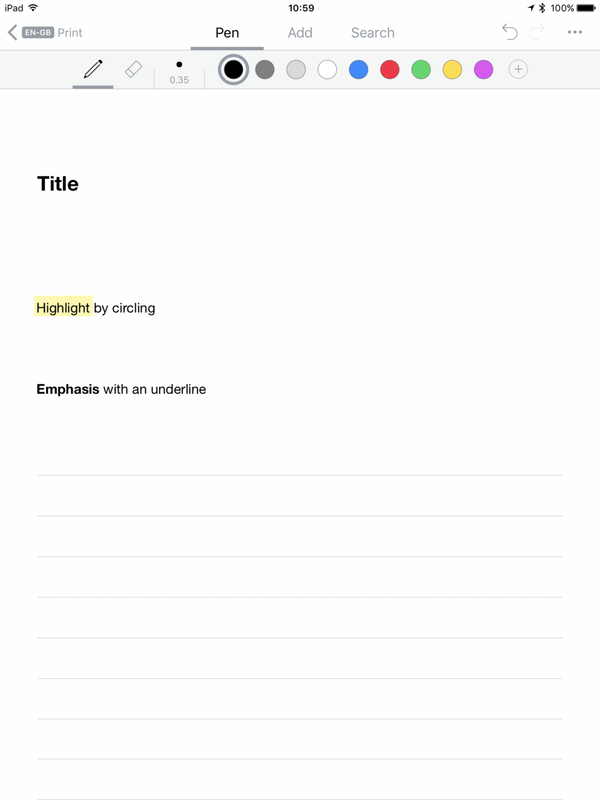 If you have a title, draw round it and the text after conversion will be highlighted. Underline a phrase and that is detected as a title and set to a heading. 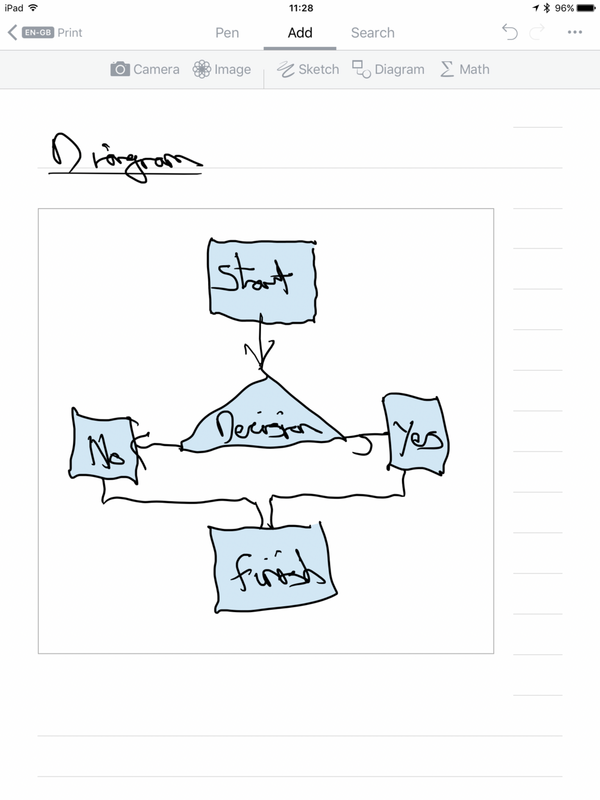 Bullet points are also recognised and even my shaky flow diagram was tidied up reasonably well! All of the individual items are still available to edit after a conversion, so corrections are easy. Nebo is an app that does everything it does well and the text conversion elevates it to near essential. Whilst it lacks the huge functionality of something like OneNote, I think it’s simplicity will appeal to people who actually just want to augment what they get out of a paper pad. That said, there are a couple of things I’d love to see them add. I’d love to have a virtual pencil case alongside the pen for the sketches. I’d also love to see cloud backup and (or) automatic export into something like Evernote or OneNote. It worries me a bit that, unless I export everything by hand, a lost device equals lost work! Finally, I’d love to be able to add tags. Nothing major, but just single out say actions from meetings or things I need to remember. Perhaps a gesture like circling a word means ‘Action’? Otherwise, Nebo is a fantastic tool for iPad Pro users and there’s no need to slip into a debate about whether it can replace the PC because Windows owners can also enjoy Nebo on the Surface Pro. Each to their own and long live the stylus!